The Netherlands are flat. Very flat. That flatness is one of the things to experience when you go there. Yes, you’ll see a glimpse when you arrive at Schiphol Airport (AMS) but no, that’s not what it really looks like. Yes, there are regular daily guided tours to the oldest pieces of reclaimed land called polders just north of Amsterdam, which are very pretty. Beautiful old wooden windmills. Some old steam driven pumping stations and meandering ditches and canals. Now come and experience flat. The largest polder ever created in this low country is the Flevopolder. It measures 970 square kilometres, divided in two parts. And that’s exactly where you should go: the dike which divides this huge polder in two. First of all, it’s close to Amsterdam. For most visitors to this small country it would even be close to Maastricht, which is probably the furtherest you can be from this polder. One of the advantages is you can get a marvellous view of the polder by sitting on the train. Just go to Amsterdam Central Station and jump on the direct train to Lelystad. The ride takes only about 45 minutes. The city of Lelystad was founded in 1967 and was named after the man who engineered the Afsluitdijk, making the reclamation possible in the first place. As a city it is not a very interesting spot (yet? ), but when you’re into modern architecture or want to see a replica of a 1628 trading vessel used by the Dutch East India Company it’s worth leaving the Lelystad train station. Although the train ride is rather beautiful, you may want to rent a car or maybe even a car with a driver (as driving can be an unpleasant experience in Amsterdam when you’re not used to bicycles*). 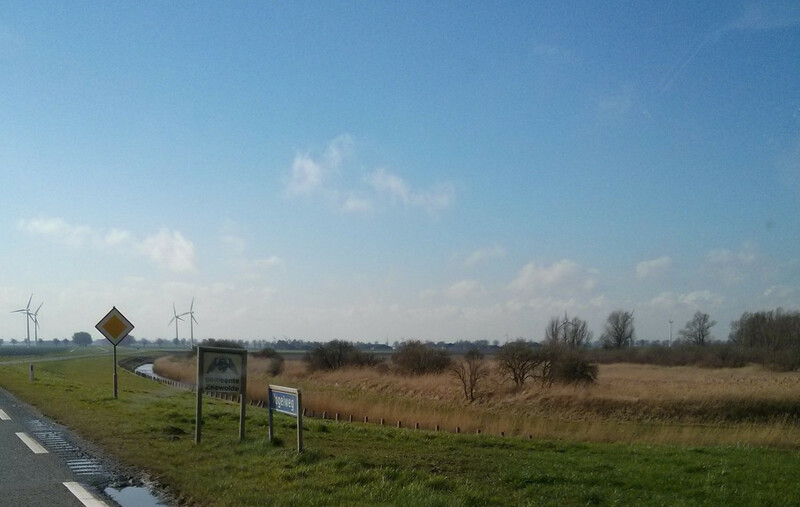 The A1 and A6 motorways (free of bicycles) take you to the polder within twenty minutes. After a while, leave the motorway, get out of the car and look around. You won’t get lost. 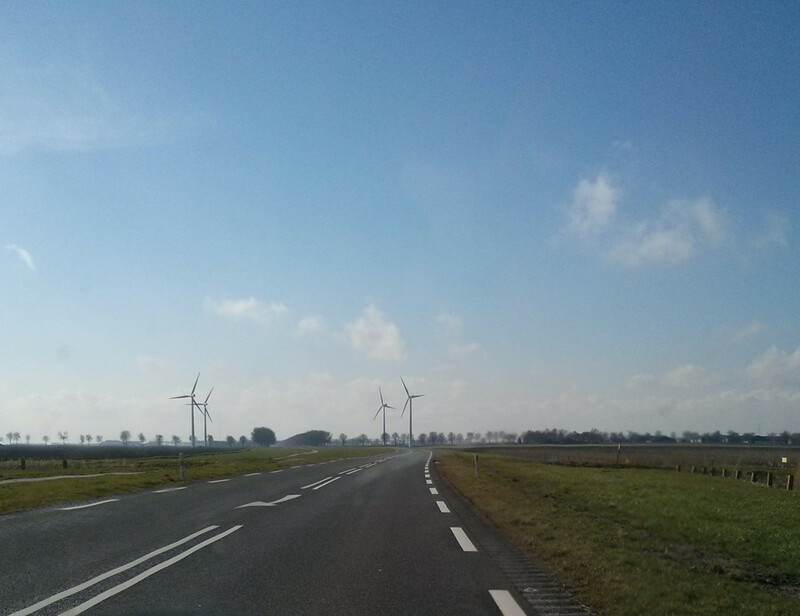 The total round trip from Amsterdam centre to the centre of Flevoland (the polder’s real name) including some sight seeing, is about 120 kilometres. But, first things first. When entering the polder, you’ll pass a city called Almere. Its first buildings weren’t erected until early 1976. The city is quite large, according to Dutch standards, but has hardly any cultural hotspots. It has quite an interesting infrastructure because of its separate infrastructure for bikes, cars and buses. After the last bits of Almere, you’ll pass a few concrete elephants and a bridge. After that, a vast canvas consisting of agricultural land, unfolds. Roads traverse in straight lines through the fields. Here and there a farm and windmills (the modern, electricity generating ones). As stated before, the polder is divided in two parts: the eastern and the southern part. The dike dividing the two parts is practically in the middle with the motorway running over it. 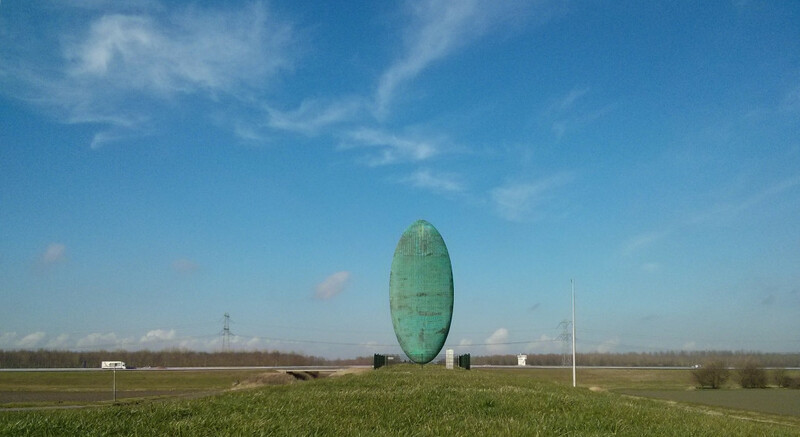 On this dike you’ll see a piece of art called the ‘Tongue of Lucifer’ which makes an excellent side trip. Just after you spotted the artwork on the dike, there is an exit going right to Lelystad. Get off there. At the end of the exit lane, go right again and take the second to the right (yes, you’re driving back south west after going north east for about twenty minutes). This should be the Meerkoetenweg. At the end of the road you can’t do much more but park the car, get out of the vehicle and walk al the way to the Tongue. Impossible to miss (except for when all the copper would be stolen again, this happened a few years ago). Before you ascent the dike, realise you’ve been driving and now walking on an old sea floor! There used to be between 2,4 and 3 metres of water above your head. After walking on the dike for a while and when visibility is good, the flat, engineered land will get to you. This asks for more. Jump back in the car, and take the first road to the right, direction N706. At the N706, direction Amsterdam, take another right after about five minutes on the Reigerweg, direction Oostvaardersplassen. The Oostvaardersplassen are an example of what happens to new land when you don’t touch it for a few decades. Dutch people call it ‘wilderness’. You can’t enter the ‘wilderness’, but there are some nice lookouts on the outskirts. A particular nice one sits in the corner of the Reigerweg and Praamweg. Bring binoculars if you can. Just follow the road. After a few corners, you’ll be on the southern tip of Lelystad. From there you drive back all along the dike separating the IJsselmeer from the Oostvaardersplassen. Viewpoints all over the place. Before you know it, you’ll be back in Amsterdam but with a different view of the Netherlands and its countryside. * Dutch people on bicycles are close to impossible. If you hit one with a car, the car (driver) is always guilty (with a few exceptions). En groen, althans het gras. Grijs, het asfalt. Met witte lijnen. 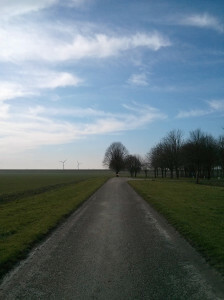 Haaks staande windmolens op het horizontale landschap. Plukjes bomen her en der. Een huis, een boerderij, een schuur. De Knardijk die noord en zuid scheidt. 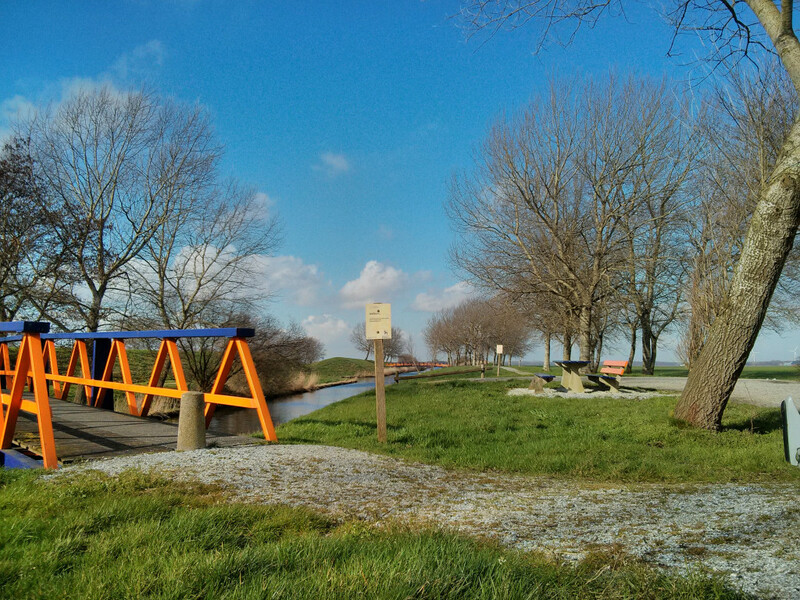 Als ongepoetst zilver schitterende kanalen en sloten verdiept in het gewest. De Flevopolder. Als een onbeschilderd canvas baadt hij in de winterzon. De gewassen zijn nog niet geplant. Het perspectiefraster van wegen doorkruist de velden. Het zomertableau nog onbekend.